Print is dead! Except it isn't! 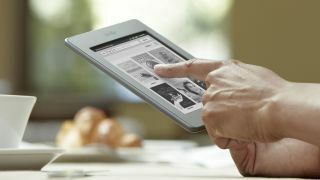 Amazon UK is now selling more Kindle books than printed books in the UK for the first time ever. Hardback, paperback, softback, pop-up, peep-hole – you name it, Kindle books are outselling it just two years after the Kindle launched in the UK. For every 100 print books sold by Amazon.co.uk in 2012, the retailer has sold 114 digital versions, with the Kindle encouraging Brits to buy more books from Amazon too. The retailer reckons that Kindle readers buy four times the number of books they did before they owned a Kindle, although there's no guarantee that they weren't simply buying books from elsewhere. But it's not the end for print either, as Amazon says its physical book sales are also on the up and Kindle owners haven't turned their back on the printed page either. "Customers in the UK are now choosing Kindle books more often than print books, even as our print business continues to grow," said Jorrit Van der Meulen, vice president, Kindle EU. "We hit this milestone in the US less than four years after introducing Kindle, so to reach this landmark after just two years in the UK is remarkable and shows how quickly UK readers are embracing Kindle. "As a result of the success of Kindle, we're selling more books than ever before on behalf of authors and publishers. And thanks to Kindle Direct Publishing, thousands of self-published authors have also been given an outlet to share their work with the millions of Kindle readers worldwide."